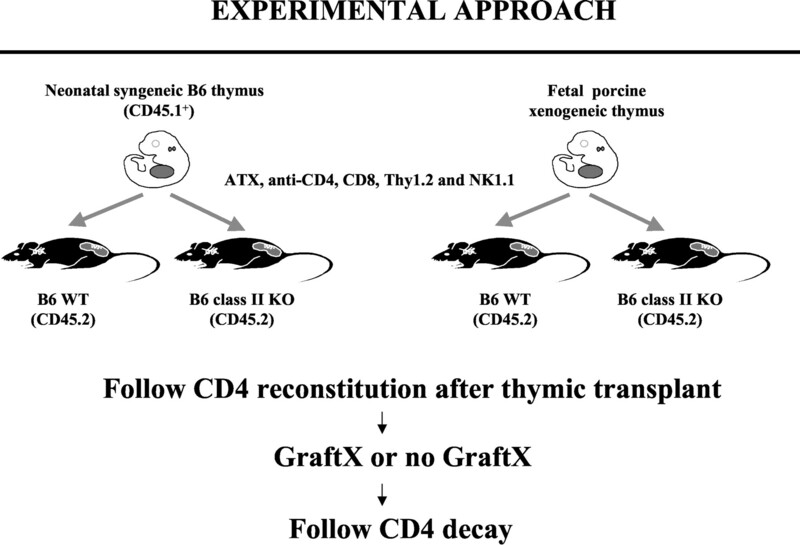 CD4 repopulation can be achieved in T cell-depleted, thymectomized mice grafted with xenogeneic porcine thymus tissue. These CD4 T cells are specifically tolerant of the xenogeneic porcine thymus donor and the recipient, but are positively selected only by porcine MHC. Recent studies suggest that optimal peripheral survival of naive CD4 T cells requires the presence of the same class II MHC in the periphery as that of the thymus in which they were selected. These observations would suggest that T cells selected on porcine thymic MHC would die rapidly in the periphery, where porcine MHC is absent. Persistent CD4 reconstitution achieved in mice grafted with fetal porcine thymus might be due to increased thymic output to compensate for rapid death of T cells in the periphery. Comparison of CD4 T cell decay after removal of porcine or murine thymic grafts ruled out this possibility. No measurable role for peripheral murine class II MHC in maintaining the naive CD4 pool originating in thymic grafts was demonstrable. However, mouse class II MHC supported the conversion to, survival, and/or proliferation of memory-type CD4 cells selected in fetal porcine thymus. Thus, the same MHC as that mediating positive selection in the thymus is not critical for maintenance of the memory CD4 cell pool in the periphery. Our results support the interpretation that xenogeneic thymic transplantation is a feasible strategy to reconstitute CD4 T cells and render recipients tolerant of a xenogeneic donor. Due to the shortage of allogeneic donors, there is increasing interest in the use of xenogeneic porcine donors for transplantation. Miniature swine are similar in size and physiology to humans and their breeding characteristics make them well-suited as xenograft donors (1). However, clinical xenotransplantation may only be feasible if recipients can be made tolerant to donor xenoantigens, because the amount of nonspecific immunosuppression required to protect the organs from rejection would be clinically intolerable (2). Thymic CD4 T cell differentiation and maturation depends on interactions with self-peptide/MHC complexes expressed on thymic stromal and dendritic cells. Positive selection generates a repertoire of T cells that bind self-MHC/peptide complexes expressed on cortical thymic stromal cells (3, 4, 5, 6). Negative selection purges the repertoire of thymocytes with TCRs that bind with relatively high affinity to self-peptide/MHC complexes (7, 8). Thus, thymocytes that pass both of these checkpoints will mature into single positive T cells and migrate to the periphery to populate the peripheral lymphoid tissues. We have shown in previous reports that porcine thymic tissue is capable of growing and repopulating and maintaining a peripheral murine CD4 T cell compartment that shows donor-specific tolerance in normal, thymectomized mice treated with T cell-depleting Abs (9, 10). CD4 repopulation in these mice attains similar levels to those in euthymic control mice treated with the same conditioning regimen. Furthermore, CD4 reconstitution has also been efficiently achieved by porcine thymic implantation in class II knockout (KO)4 mice (11), indicating that class II expressed by porcine thymic epithelial cells can mediate positive selection of murine CD4 cells. In addition, the T cell repertoire selected by porcine thymus restored the immune competence of recipient mice so that they cleared Pneumocistis carinii infections, and these mice were capable of mounting host-restricted immune responses (12). Tolerance to xenogeneic porcine Ags has also been achieved for human T cells developing in porcine xenografts in immunodeficient mice, suggesting that this approach has potential to induce clinical xenograft tolerance (13). In view of the above results, an open question in this model was how to account for the long-term survival and maintenance of a T cell repertoire in the murine periphery following intrathymic selection on porcine MHC. A number of recent reports have shown that optimal peripheral long-term survival of naive CD4 T cells requires continuous stimulation through the TCR by self-peptide/class II MHC complexes (17, 18, 19, 20, 21, 22, 23). Although it seems clear that the absence of class I or class II in the environment reduces the proliferation of naive CD8 (24, 25) and CD4 (26, 27, 28) T cells, respectively, the role of MHC class II in the long-term survival of CD4 T cells seems to be more modest (17, 18, 27, 29). To account for the peripheral survival of mouse T cells selected on a highly disparate porcine MHC, two possible hypotheses were considered. One was that T cell survival did not depend on interactions with the same MHC as that of the thymus in which they were selected because the repertoire of T cells selected by porcine MHC was broad and had sufficient cross-reactivity with murine MHC/peptide complexes to permit optimal survival in the periphery. Alternatively, the maintenance of CD4 T cell numbers in the periphery might be the consequence of high output of T cells by the porcine thymus. 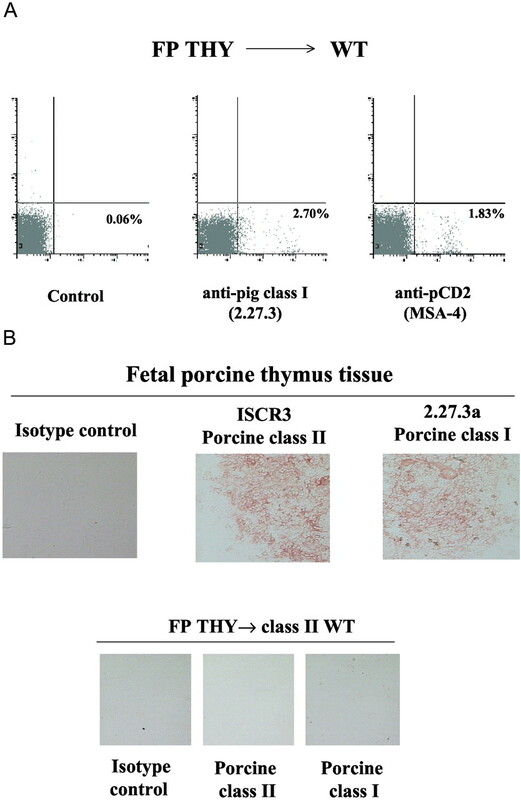 Continuously high output of T cells from fetal porcine thymus (FPTHY) grafts might be required to replace T cells dying rapidly in the periphery due to the absence of the selecting MHC. To discriminate between these two hypotheses, we have grafted adult thymectomy (ATX), T cell-depleted wild-type (WT), and class II-deficient mice with FPTHY or syngeneic neonatal mouse thymus tissue. After peripheral T cell reconstitution was achieved, thymic grafts were removed and the decay of total and naive-type T cells was followed in the periphery. Four- to 8-wk-old C57BL/6Tac-[KO] Abb N5 (class II-deficient mice, CD45.2+) (30) and C57BL/6 (wild type, CD45.2+) mice were purchased from Taconic Farms (Germantown, NY), thymectomized, and used as recipients. One-day-old CD45.1+ neonatal mice were used as neonatal thymic donors. Second trimester (gestational age 50–75 days, estimated by observed estrus or mating and confirmed by ultrasound examination of the fetuses) partially inbred swine leukocyte Ag (SLAgg; class Icc and class IIdd) Massachusetts General Hospital miniature swine fetuses were used as donors of porcine thymic tissue. Massachusetts General Hospital miniature swine have been bred to homozygosity for the MHC complex (SLA) (1, 31). Animal handling and care were in accordance with the Massachusetts General Hospital and American Association for the Accreditation of Laboratory Animal Care guidelines. All mice were maintained in a specific pathogen-free facility and were housed in microisolator cages containing autoclaved feed, bedding, and acidified water. Four- to 8-wk-old C57BL/6 mice and C57BL/6 class II-deficient mice were thymectomized (ATX) as described (32) 15 days before the conditioning regimen was initiated. Complete removal of the thymus was confirmed at the time of sacrifice by flow cytometry analyzing the residual tissue around the thymic area. The absence of CD4/CD8 double-positive T cells ruled out the presence of residual host thymic tissue. The conditioning regimen for thymic transplantation consisted of i.p. injection of the following depleting mAbs on days −6 and −1 pretransplant and days +7 and +14 posttransplant: anti-CD4 (clone GK1.5, 1.76 μg/injection), anti-CD8 (clone 2.43, 1.45 μg/injection), anti-Thy1.2 (clone 30H12, 0.55 μg/injection), and anti-NK1.1 (clone PK136, 150 μg/injection) (10, 33). On the day of the transplant, mice received a low dose (3 Gy) of total body irradiation. Neonatal B6 CD45.1+ pups (< 1 day old) were anesthetized with inhaled methoxyflurane. The thoracic cavity was exposed, and thymic lobes were removed and placed in RPMI 1640 medium (Life Technologies, Gaithersburg, MD) containing gentamicin 50 μg/ml (Life Technologies). The mice were euthanized by anesthetic overdose. Neonatal syngeneic mouse thymus and xenogeneic fetal porcine thymus were grafted under the right kidney capsule of ATX B6 wild-type and class II KO mice treated with the above nonmyeloablative conditioning regimen. FPTHY was harvested from pregnant sows as previously described (9, 10) and placed in RPMI with antibiotics. About 2 mm3 of FPTHY or four lobes of mouse neonatal thymus from B6 Ly5 congenic (CD45.1+) donors were grafted under the kidney capsule as described (10). For graftectomy (graftX), unilateral nephrectomy of the kidney containing the mouse or porcine thymic graft was performed by opening the peritoneal cavity and clamping the renal artery and vein of the right kidney. The vessels were sutured above and below the clamp and were cut before the clamp was released, and the kidney was removed. Thymectomy, thymic transplantation under the kidney capsule, and nephrectomy of the kidney containing the thymic graft were all performed after i.p injection of ketamine (0.08 mg/g) and xylazine (0.012 mg/g) in combination with supplemental inhaled methoxyflurane (Pitman-Moore, Mundelein, IL) to maintain stage III anesthesia. Reconstitution and decay of CD4+ PBLs and naive-type CD4 T cells (CD4+CD44low and CD4+CD62 ligandhigh (CD62Lhigh)) were assessed by two-color flow cytometry (FCM) of peripheral blood cells. PBMCs were isolated by Histopaque gradient 1077 (Sigma-Aldrich, St. Louis, MO), washed in FACS buffer consisting of 1× HBSS, 0.01% sodium azide, and 1% BSA, and residual red cells were lysed in ammonium chloride potassium lysing buffer (BioWhittaker, Walkersville, MD). Cells were incubated with mAbs for 30 min at 4°C. Dead cells were excluded by propidium iodide retention, and granulocytes were excluded on the basis of forward angle and 90° light scatter characteristics. A total of 5000 gated events were collected from each sample. FCM acquisition was conducted on a FACScan cytometer (BD Biosciences, Mountain View, CA). Data analysis was performed using WinList (Verity Software House, Topsham, ME). The pre- to post-graftX ratio of CD4 T cells and subsets was calculated by dividing the percentage of each cell type at 7 and 15 wk after graftX by the percentage of such cells in PBMCs immediately before graftX. Cells were stained with the following mAbs: FITC-labeled anti-mouse TCRαβ (clone H-57-597), PE-labeled anti-mouse CD4 (clone RM4-5), PE-labeled rat anti-mouse CD8 (clone 53-6.7), biotinylated anti-mouse CD62L (clone MEL-14), biotinylated anti-mouse CD45RB (clone 16A), and biotinylated anti-mouse CD44 (clone IM7). Biotinylated anti-mouse CD45.1 (clone A20) was used to differentiate donor (CD4+CD45.1+) from host (CD4+CD45.1−) cells. Streptavidin-CyChrome was used to develop Abs bound to biotin. FITC-labeled nonreactive mouse IgG2a (clone HOPC1), PE-conjugated rat IgG2a (clone R35-95), and biotin-conjugated mouse IgG2a (clone HOPC1) were used as negative controls. With the exception of HOPC1 (prepared in our laboratory), all of the reagents were purchased from BD PharMingen (San Diego, CA). 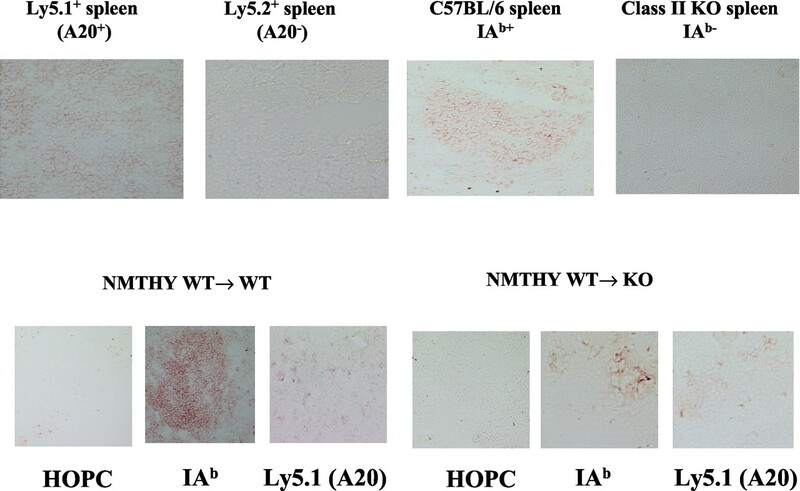 Immunohistochemical studies were conducted to evaluate the presence of mouse and pig class II-positive APCs that may have migrated from the thymic graft to the peripheral secondary lymphoid organs. The following primary Abs were used: mouse mAb 25-9-17, an IgG2a recognizing the mouse class II allele IAb, was used to detect the presence of mouse class II-positive APCs, and clone HOPC1 was used as an IgG2a isotype control. Mouse anti-mouse CD45.1 (clone A20, IgG2a) was used to detect migration of thymus donor-derived cells to peripheral lymphoid organs. Mouse anti-pig class II-specific mAb (clone ISCR3, IgG2b) recognizing SLA class II DR allowed detection of porcine class II-positive cells that may have migrated from the porcine thymus to peripheral murine lymphoid organs. Mouse anti-pig class I MHC mAb (clone 2.27.3a, IgG2a) was also used to detect porcine cells that may have migrated from the porcine thymus graft. Spleens from FPTHY and neonatal mouse thymus (NMTHY)-grafted class II WT and class II KO mice were harvested at the time of sacrifice. Spleens from nongrafted normal class II WT and class II KO mice were used as positive and negative controls, respectively, for the expression of mouse class II. FPTHY was used as a positive control for the mAbs recognizing porcine class I and class II molecules. Tissue was processed for immunohistology according to the following protocol: spleens were snap frozen in liquid nitrogen and stored at −80°C. Five-micrometer sections were cut with a cryostat at −25°C and were air dried. They were then fixed in cold acetone and stored at −80°C until staining was performed. Staining was performed as previously described (10, 13). Frozen slides were thawed and incubated with unlabeled primary Ab for 30 min at room temperature. Endogenous peroxidase enzymatic activity was inactivated by incubation with hydrogen peroxide. Biotinylated secondary rat anti-mouse IgG2a and IgG2b (BD PharMingen) mAbs were used. Vectastain ABC kit (Vector Laboratories, Burlingame, CA) was used to develop the reaction. The immunoreactivity was visualized using the substrate 3-amino-9-ethylcarbazol (Aldrich, Milwaukee, WI), which produces a brown color on positive cells. Finally, slides were counterstained with hematoxylin. Stained specimens were evaluated by microscopy and images were stored in the computer through a digital camera. Student’s t test was used to determine the significance of differences in means. The nonparametric Mann-Whitney U test was used to compare the medians of groups that did not follow a normal distribution according to the Shapiro-Witt test. A p value of <0.05 was considered significant. Excel (Microsoft, Redmond, WA) and Prophet software (BBN Systems and Technologies, Cambridge, MA) were used to perform the statistical analyses. To explain the stable CD4 repopulation consistently observed in B6 mice grafted with a highly disparate xenogeneic thymus, the following experiment was devised. ATX B6 WT and class II KO (CD45.2+) mice were treated with the conditioning regimen described in Materials and Methods and grafted with either FPTHY or NMTHY tissue. Class II KO mice served as controls, allowing the examination of CD4 cell decay in mice lacking endogenous class II expression in the periphery. Thirteen weeks after thymic transplantation, the kidney containing the porcine or mouse thymic graft was removed, and the decay of CD4 T cells and subsets was followed (Fig. 1⇓). As donors of neonatal mouse thymus, B6 mice congenic for CD45 (CD45.1+) were used, permitting assessment of the contribution of donor T cells from the thymic graft to the initial repopulation of the peripheral T cell compartment. Experimental design. WT and class II KO conditioned B6 mice were grafted in parallel with either NMTHY or FPTHY. They were allowed to reconstitute the CD4 T cell compartment for 13 wk, at which time the kidney containing the thymic graft was removed (GraftX). T cell decay was followed up to 15 wk post-graftX. Peripheral T cell reconstitution was initially of donor origin (CD45.1+ T cells) in WT and class II KO mice grafted with NMTHY. Donor thymocytes were present in the thymic graft at the time of implantation and they differentiated and migrated to the periphery, filling up the emptied peripheral compartment. The level of peripheral CD4 reconstitution was significantly higher for both donor and host CD4 T cells (CD45.1 and CD45.2) in class II KO recipients compared with WT recipients of CD45.1 B6 thymic grafts by 5 wk postimplantation (p < 0.0005). Peripheral repopulation of host-derived CD4 T cells (CD45.2+) occurred rapidly in both WT and class II KO recipients, and by 9 wk after transplantation they predominated over donor-derived T cells (Fig. 2⇓). Kinetics of donor (CD45.1+) and recipient (CD45.2+) CD4 T cell reconstitution in PBMCs of NMTHY-grafted WT and class II KO mice before the thymic grafts were removed. •, Donor CD4+CD45.1+ cells; ○, recipient CD4+CD45.2+ cells. Each symbol represents an individual animal. We compared the kinetics of recipient-derived (CD45.2+) CD4 reconstitution in WT mice grafted with NMTHY vs FPTHY. Recipient-derived CD4 reconstitution was more rapid in recipients of NMTHY than in those receiving FPTHY (p < 0.05 and p < 0.0005 at 9 and 11 wk after transplantation, respectively; Fig. 3⇓A). A similar outcome was observed when class II KO mice were grafted with either NMTHY or FPTHY. Statistically significant differences were observed between both groups at 5 and 11 wk after thymic transplantation (p < 0.0005 and p < 0.05, respectively; Fig. 3⇓B). By 15 wk and later after thymic transplant, the degree of recipient CD4 repopulation was similar in both WT and class II KO mice (Fig. 3⇓). Delayed reconstitution of recipient-derived peripheral CD4 cells in class II KO and WT mice grafted with FPTHY compared with mice grafted with NMTHY. A, Comparison of the kinetics of recipient-derived (CD45.2+) CD4 reconstitution in WT mice grafted with either NMTHY or FPTHY. •, WT mice grafted with NMTHY; ○, WT mice grafted with FPTHY. B, Comparison of the kinetics of recipient-derived (CD45.2+) CD4 reconstitution in class II KO mice grafted with either NMTHY or FPTHY. •, Class II KO mice grafted with NMTHY; ○, class II KO mice grafted with FPTHY. Each symbol represents an individual animal. Student’s t test was used to compare the groups. CD4 T cells repopulating the peripheral pool arose from the thymic grafts, as the percent CD4+ T cells in PBLs of ATX conditioned control mice were always <10%, as reported consistently in our model (10, 11, 12, 14, 32, 34, 35). To confirm the importance of peripheral class II MHC expression as a survival signal for CD4 T cells generated in class II WT mouse thymus, we grafted conditioned B6 WT and class II KO mice with syngeneic neonatal thymus (CD45.1+). CD4 recovery was followed, and the decay of CD45.2 (recipient-derived) CD4 T cells was assessed after removal of the graft by unilateral nephrectomy of the kidney containing the thymic graft. The percent CD4+ PBLs at the time of graftX (15 wk postimplantation) was compared with the percent CD4+ PBLs at 7 and 15 wk after the time of graftX in non-graftX controls and in graftX WT and class II KO NMTHY-grafted mice. Non-graftX and graftX groups had similar levels of peripheral blood CD4 cells at the time of graftX (Figs. 4⇓, A and B). Non-graftX controls showed a statistically significant decline with time in the percent CD4+ PBLs at 22 wk (7 wk after the time of graftX in the graftX group) only in NMTHY-grafted class II KO mice (p < 0.0005), but a decline to similar levels was evident by 30 wk in both WT and class II KO mice (p < 0.05 in NMTHY WT-grafted mice and p < 0.0005 in NMTHY class II KO mice; Fig. 4⇓A). Thus, even in the presence of a thymus graft, a decline in peripheral CD4 T cells occurred over time. A significant reduction in the percent CD4+ PBLs was only observed at 15 wk post-graftX in NMTHY-grafted class II KO mice compared with WT mice. A, Decay of the percent CD4+ PBLs in NMTHY-grafted WT and class II KO mice at 7 and 15 wk after removal of the kidney containing the thymic graft. •, Percent CD4+ PBLs at the time of graftX in either NMTHY-grafted WT or class II KO B6 mice; ○, percent CD4+ PBLs at 7 wk post-graftX; ⋄, percent CD4+ PBLs at 15 wk post-graftX. Each symbol represents an individual animal. B, Decay of percent CD4+ PBLs in NMTHY-grafted WT and class II KO mice at 7 and 15 wk after the time of graftX in non-graftX control mice. •, Percent CD4+ PBLs at the time of graftX in either NMTHY-grafted WT mice or class II KO B6 mice; ○, percent CD4+ PBLs at 7 wk post-graftX; ⋄, percent CD4+ PBLs at 15 wk post-graftX. Paired (individual animals at two time points) Student’s t test was used to compare the percent CD4+ PBLs at the time of graftX with the percent CD4+ PBLs at 7 and 15 wk post-graftX in WT and class II KO NMTHY-grafted mice. Student’s t test for comparison of means was used to compare NMTHY-grafted class II WT and NMTHY-grafted class II KO B6 mice at 7 and 15 wk post-graftX. Each symbol represents an individual animal. C, Comparison of the percentage of CD4+ PBLs of non-graftX and graftX NMTHY-grafted WT (top panel) and class II KO mice (bottom panel) at 7 and 15 wk after graft removal. ♦, Non-graftX mice; ⋄, graftX mice. Each symbol represents an individual animal. Student’s t test for comparison of means was applied to compare the groups. D, Decay of the pre- to post-graftX ratio of percent CD4+ PBLs in NMTHY-grafted WT and class II KO mice at 15 wk after removal of the kidney containing the thymic graft. ♦, Non-graftX class II WT or KO B6 mice receiving NMTHY grafts; ⋄, graftX mice receiving NMTHY grafts. Student’s t test for comparison of means was applied to compare the groups. Each symbol represents an individual animal. GraftX of NMTHY-grafted WT mice led to a significant reduction in the percentage of peripheral blood CD4 T cells 7 and 15 wk later (p < 0.0005; Fig. 4⇑B). GraftX in class II KO NMTHY-grafted mice was also associated with a statistically significant decline in the percent CD4+ PBLs at 7 and 15 wk post-graftX compared with pre-graftX levels (p < 0.0005; Fig. 4⇑B). When the percent CD4+ PBLs in non-graftX was compared with that in the graftX group of NMTHY-grafted mice 7 and 15 wk after graftX, a significant decrease of the percent CD4+ PBLs was observed in the graftX WT compared with the non-graftX animals in each group (p < 0.0005 and p < 0.005 at 7 and 15 wk after graftX, respectively; Fig. 4⇑C). Likewise, a significant decrease in the percent CD4+ PBLs was also detected in the graftX NMTHY-KO group compared with non-graftX controls (p < 0.05 at 7 and 15 wk after graftX; Fig. 4⇑C). Therefore, the continued presence of the thymic graft helped to maintain the percentage of peripheral blood CD4 cells at 22 and 30 wk in non-graftX controls. At 7 wk post-graftX, the decline in the percent CD4+ PBLs in graftX NMTHY-grafted class II KO mice was not more pronounced than that in class II WT mice (Fig. 4⇑B). At 15 wk post-graftX, however, slightly higher percentages of CD4 T cells were detected in PBLs of graftX class II WT than in class II KO mice (Student’s t test, p < 0.05; Fig. 4⇑B). Likewise, at 15 wk after graftX, the ratio of pre- to post-graftX percentages of CD4+ PBLs was significantly lower in graftX class II KO NMTHY-grafted mice than in similarly treated WT NMTHY-grafted mice (p < 0.05; Fig. 4⇑D). These results are consistent with the interpretation that the presence of class II in the periphery is necessary at least for the optimal long-term survival of murine CD4+ T cells. Overall, these observations suggest that, only in the long term, class II expression in the periphery may modestly influence the survival of mouse T cells, in agreement with other recent reports (19, 21, 22, 18, 27). We compared the decay of naive CD4 T cells (CD4+CD44low) in graftX NMTHY-grafted class II KO and WT mice. We alsoanalyzed the naive CD4 T cells defined by the CD4+CD62Lhigh phenotype (data not shown) and obtained results similar to those with analysis of the CD4+CD44low population. In WT mice, the graftX group showed a significant reduction in the percentage of naive-type CD4+ PBLs and in the pre- to post-graftX ratio of naive CD4 cells at 7 and 15 wk after graftX compared with non-graftXcontrols (p < 0.05; Fig. 5⇓, A and B). A significant reduction in the pre- to post-graftX ratio of naive CD4 cells was also observed at 7 and 15 wk in graftX compared with control class II KO NMTHY-grafted mice (p < 0.05; Fig. 5⇓, A and B). Thus, the graft was required for the long-term maintenance of the naive CD4 population in both WT and KO mice. Peripheral naive-type CD4 T cells selected in a syngeneic thymus do not decay more rapidly in class II KO than in WT mice. Comparison of the pre- to post-graftX ratio of percent naive-type CD4+ (CD4+CD44low) NMTHY-grafted WT and class II KO mice at 7 (A) and 15 (B) wk after graftX. Paired Student’s t test was used to compare non-graftX (♦) and graftX (⋄) NMTHY-grafted class II WT or KO B6 mice. Student’s t test for comparison of means was used to compare non-graftX WT to class II KO mice and graftX WT to class II KO B6 mice. The pre- to post-graftX ratio of percent naive-type CD4+ cells was calculated by dividing the percent naive-type PBLs post-graftX by the percent naive-type (CD4CD44low) PBLs pre-graftX. No significant differences were found when graftX NMTHY-grafted WT mice were compared with graftX NMTHY-grafted class II KO mice. A significant effect of thymic graft removal was seen at 7 and 15 wk after graftX in NMTHY-grafted WT and class KO mice. Each symbol represents an individual animal. C, Peripheral memory-type CD4 T cells (CD4+CD44high) selected in a syngeneic thymus show more marked decay in class II KO than in WT mice at 15 wk after graftX. Comparison is shown of the pre- to post-graftX ratio of percent memory-type CD4+ (CD4+CD44high) PBLs in NMTHY-grafted WT and class II KO mice at 7 and 15 wk after graftX. Paired Student’s t test was used to compare non-graftX (♦) and graftX (⋄) NMTHY-grafted WT and class II KO B6 mice. The pre- to post-graftX ratio of percent memory-type CD4+ cells was calculated by dividing the percent memory-type PBLs at the indicated time post-graftX by the percent memory-type (CD4+CD44high) PBLs pre-graftX. Student’s t test for comparison of means was applied to compare the groups. Each symbol represents an individual animal. The decay of naive-type CD4 cells after graftX of NMTHY-grafted class II KO mice was not more pronounced than that in similarly treated WT mice (Fig. 5⇑, A and B). Thus, graftX caused a significantly accelerated decay of naive-type CD4 cells in both groups, but a role for peripheral class II MHC in maintaining the survival of naive-type CD4 cells could not be demonstrated in this system. We also followed the decline in memory CD4 T cells (CD4+CD44high) at 7 and 15 wk after thymic graft removal. 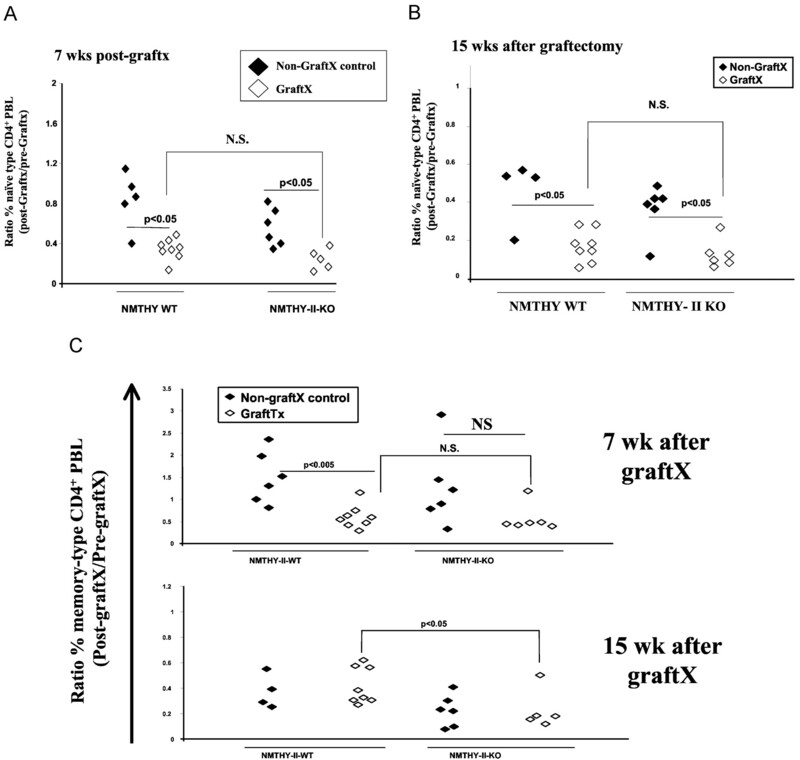 GraftX led to a significant decline in the pre- to post-graftX ratio of percent memory CD4+ PBLs in WT NMTHY-grafted mice compared with non-graftX control (p < 0.005) mice at 7 wk, but not 15 wk, after thymic removal. GraftX did not significantly affect the pre- to post-graftX ratios in NMTHY-grafted class II KO mice at either time point (Fig. 5⇑C). However, by 15 wk post-graftX, the decline in the pre- to post-graftX ratio of percent memory-type CD4+ PBLs was significantly more pronounced in graftX class II KO NMTHY-grafted mice than in graftX WT NMTHY-grafted mice. Therefore, we conclude that the greater decline in CD4 T cells in graftX KO compared with class II WT mice by 15 wk post-graftX was due to a greater decline in memory CD4 cells in class II KO compared with WT mice. One possible explanation for the failure to demonstrate a difference in the decay of naive-type T cells after graftX in WT vs class II KO NMTHY-grafted mice is that class II+ cells from the NMTHY graft emigrate from the graft and repopulate the periphery, as has been previously reported (17, 21, 29). Therefore, we performed immunohistochemical studies to evaluate the presence of murine class II+ cells in the peripheral lymphoid organs of NMTHY-grafted class II KO mice. These studies were performed at 30 wk after thymic implantation (15 wk after graftX). As expected, murine class II+ cells were readily detected in spleens of WT mice grafted with NMTHY (Fig. 6⇓) or FPTHY tissue (data not shown). Class II staining was most prominent in the B cell areas of the spleen. Importantly, a few scattered mouse class II-positive cells were identified in class II KO mice grafted with NMTHY from WT B6 mice (Fig. 6⇓). Three spleen samples from each group were examined by immunohistochemistry and showed similar results. Thus, migration of class II-positive cells from the donor thymus might have helped to support peripheral CD4+ T cell survival in class II KO recipients of NMTHY grafts. Migration of donor-derived thymic class II+ cells to the periphery of class II KO mice. Monoclonal Abs to the donor CD45 allele Ly5.1 (clone A20) and class II anti-IAb (clone 25-9-17) were used. In the first row, control spleen samples are shown stained with anti-Ly5.1 (Ly5.1 spleen), anti-Ly5.1 (Ly5.2 spleen), anti-IAb (B6 spleen), and anti-IAb (class II KO). The second row shows splenic tissue obtained from WT Ly5.2 B6 mice grafted with NMTHY harvested from Ly5.1 B6 mice. Spleen samples are stained with isotype control Ab (HOPC1), anti-class II Ab (clone 25-9-17), and anti-Ly5.1 (clone A20). Also shown is spleen in class II KO B6 mice grafted with WT NMTHY and stained with isotype control (HOPC1), anti-class II IAb, and anti-Ly5.1 mAb. The staining shows class II expression in class II WT spleens and migration of class II-positive cells from thymic tissue to the periphery of class II KO spleens. We compared the decay of peripheral blood CD4 T cells after graftX in ATX WT recipients of NMTHY vs FPTHY grafts. By 7 wk after graftX, a significant decline in the percent CD4+ PBLs was observed in the graftX mice compared with non-graftX recipients of FPTHY grafts, similar to results in NMTHY-grafted WT mice (Fig. 7⇓A). However, the ratio of percent CD4+ PBLs was higher at 7 wk post-graftX in both the non-graftX and graftX WT mice receiving FPTHY than in those grafted with NMTHY (Fig. 7⇓A). This difference was still statistically significant in the graftX FPTHY vs NMTHY groups at 15 wk (p < 0.05; Fig. 7⇓B). Furthermore, the pre- to post-graftX ratio of CD4+ PBLs in most non-graftX FPTHY-grafted mice was >1 at 7 wk post-graftX, whereas in NMTHY-grafted WT mice this ratio was generally <1 (Fig. 7⇓A; p < 0.05). Thus, FPTHY grafts remained functional until at least 30 wk postimplantation, and graftX led to a significant decrease in CD4 counts within 7 wk of graftX. The decay of CD4 cells in graftX FPTHY recipients was not more rapid than that in graftX NMTHY recipients. Peripheral CD4 T cells do not decay more rapidly in recipients of FPTHY than in recipients of NMTHY grafts. Comparison of the pre- to post-graftX ratio of percent CD4+ PBLs in NMTHY- or FPTHY-grafted WT mice at 7 (A) and 15 (B) wk after graftX. ♦, Non-graftX controls; ⋄, graftX group. Unpaired Student’s t test was used to compare the non-graftX control group with the graftX group. The decline of naive-type CD4 (CD4+CD44low and CD4+CD62Lhigh) T cells was also evaluated in graftX FPTHY recipients. Analysis of naive CD4 T cells defined by the CD4+CD62Lhigh phenotype (data not shown) produced results similar to those of the analysis of CD4+CD44low cells (Fig. 8⇓A). At 7 wk post-graftX, the removal of the FPTHY graft was associated with a statistically significant decline in the pre- to post-graftX ratio of percent naive-type CD4 T cells compared with non-graftX controls (p < 0.01). However, this decline was not significantly different from that observed in graftX NMTHY-grafted mice (Figs. 5⇑A and 8A). The decay of naive-type CD4+ cells is not more rapid after graftX in FPTHY-grafted compared with NMTHY-grafted WT mice. Comparison of the pre- to post-graftX ratio of percent naive-type CD4+ cells in class WT mice grafted with either NMTHY or FPTHY at 7 (A) and 15 (B) wk after graftX. ♦, Individual non-graftX controls; ⋄, graftX mice. Student’s t test for comparison of means was used to compare the nongrafted controls with the graftX group. Each symbol represents an individual animal. C, The 15-wk post-graftX:pre-graftX ratio of percent naive CD4 cells in blood of graftX WT and class II KO mice that had received FPTHY grafts is shown. ○, Individual graftX FPTHY-grafted class II WT; ⋄, individual graftX FPTHY-grafted class II KO mice. Student’s t test for comparison of means was used to compare the two groups. D, Representative FCM plots showing staining of gated CD4+ PBLs with CD44 immediately before and 15 wk after graftX. The percentage of CD4 cells with the CD44high “memory” phenotype is shown. The placement of the marker indicating CD44high cells was determined individually from normal B6 control cells in each individual flow cytometric study (data not shown) and was maintained for all analyses performed in that assay. 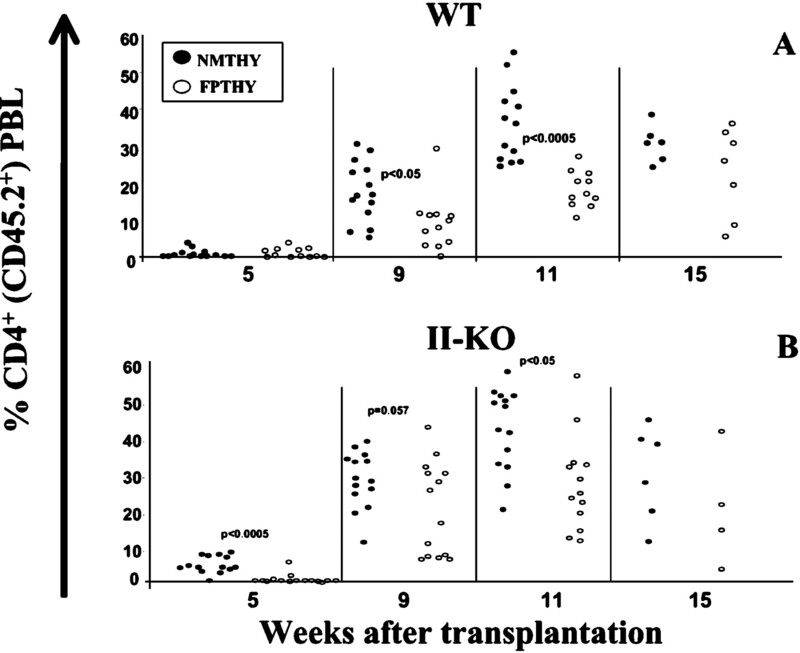 At 15 wk after thymic graft removal, similar results were observed, i.e., the pre- to post-graftX ratio of percent naive-type CD4+ cells in FPTHY-grafted mice was not significantly lower than that in NMTHY-grafted mice (Fig. 8⇑B). Thus, the decay of naive CD4 T cells was similar in WT mice, regardless of whether the cells were positively selected on a porcine or a mouse thymus. These data argue that the maintenance of naive CD4 cells observed in WT mice grafted with FPTHY is not due to increased output of T cells from porcine thymus, and suggest that peripheral survival of CD4 cells selected in a porcine thymus graft is not dependent upon the same MHC as that present on the thymic epithelium. Lack of requirement for class II MHC in the periphery for the maintenance of naive murine CD4+ T cells selected in a porcine thymus graft. To determine whether murine MHC in the periphery played a role in supporting the survival of murine CD4 T cells selected in a porcine thymus, we also evaluated the decay of CD4 cells in FPTHY-grafted class II KO mice. Although we wished to compare graftX and non-graftX mice in this study, we have previously observed a high rate of unexplained mortality in class II KO mice in which CD4 T cells reconstitute in porcine thymus grafts (11), and this occurred again in this study, so we had insufficient non-graftX FPTHY class II KO recipients to follow. Nevertheless, graftX seemed to prevent this mortality from occurring, and we were able to compare the rate of decay of T cells in graftX FPTHY-grafted WT and class II KO mice. As shown in Fig. 8⇑C, the 15 wk post-graftX:pre-graftX ratio of percent naive CD4 cells was similar in graftX WT and class II KO mice, suggesting that murine class II MHC in the periphery did not play a significant role in promoting the survival of naive CD4 cells that developed in porcine thymic grafts. FCM plots showing naive and memory CD4 cell populations from representative animals in each group before and 15 wk after graftX are presented in Fig. 8⇑D. We also compared the decay of memory CD4 T cells after removal of the FPTHY or NMTHY graft. At 7 wk after graftX, the ratio of percent memory-type CD4 cells was not significantly lower in graftX compared with non-graftX FPTHY-grafted mice. This contrasts with results in NMTHY-grafted mice, in which graftX led to a significantly greater decay of percent memory CD4 T cells compared with non-graftX NMTHY-grafted mice (Fig. 9⇓A; p < 0.05). However, no statistically significant differences were found when the graftX WT NMTHY-grafted mice were compared with WT FPTHY-grafted mice (Fig. 9⇓A), indicating that the decline in both groups was similar. At 15 wk after graftX, the ratio of percent memory CD4 cells in NMTHY-grafted mice and FPTHY-grafted mice did not show differences when the non-graftX groups were compared with graftX groups. In contrast, comparison of the non-graftX groups (NMTHY vs FPTHY) showed a significantly higher (wk 30:wk 15) ratio of percent memory-type CD4 cells in FPTHY-grafted mice than in NMTHY-grafted mice (p < 0.05). Likewise, comparison of the graftX groups (NMTHY vs FPTHY) showed a nearly significantly greater ratio of percent CD4 memory T cells in FPTHY-grafted mice than in NMTHY-grafted mice (p = 0.05; Fig. 9⇓A). A, The decline in memory-type CD4+ PBLs was not greater in FPTHY-grafted compared with NMTHY-grafted WT mice after graftX. Comparison is shown of the post- to pre-graftX ratio of percent memory-type CD4+ PBL in WT mice grafted with either NMTHY or FPTHY at 7 and 15 wk after the time of graftX. ♦, Individual non-graftX controls; ⋄, graftX mice. Student’s t test for comparison of means was used to compare the nongrafted controls with the graftX group. Each symbol represents an individual animal. B, Comparison of 15-wk post-graftX:pre-graftX ratios of memory-type CD4 cells in graftX WT and class II KO mice grafted with NMTHY or FPTHY tissue. Nonparametric Mann-Whitney rank sum test was used to compare the groups. ♦, Individual non-graftX controls; ⋄, graftX mice. Each symbol represents an individual animal. The comparison shown in Fig. 9⇑B examines the role of murine class II MHC in the periphery in maintaining the memory CD4 cell population. Regardless of whether the cells had developed in an NMTHY or an FPTHY, the 15 wk post-graftX:pre-graftX ratio of memory CD4 cells was lower in graftX class II KO mice compared with WT mice (p < 0.05 for graftX NMTHY-grafted mice and for graftX FPTHY-grafted mice). These results suggest that murine class II MHC in the periphery played a significant role in supporting the proliferation and/or survival of memory-type CD4 cells. It is also noteworthy that the post-graftX:pre-graftX ratio of memory CD4 cells in graftX WT recipients of porcine thymus grafts was significantly greater than that in graftX NMTHY recipients at 15 wk post-graftX (p < 0.05). Although residual porcine thymopoiesis was detected by flow cytometry in FPTHY grafts of WT B6 mice at the time of graftX (Fig. 10⇓A), porcine class I- or class II-positive cells were notdetected in the spleens of FPTHY-grafted WT or KO mice (Fig. 10⇓B) at 30 wk after thymic implantation (15 wk after graftX). This observation argues against the possibility that porcine class II-positive cells may have migrated to the periphery of WT mice to provide survival signals to murine CD4 cells positively selected on porcine MHC in the thymus graft. Four samples of each experimental group were examined by immunohistochemistry, showing similar results. Porcine thymopoiesis but not class II positive cell migration to the periphery. A, Residual porcine thymopoiesis in FPTHY-grafted conditioned class II WT and B6 mice is detectable by FCM. B, Absence of detectable porcine class II-positive cells in the spleen of WT mice grafted with FPTHY. Collectively, our results in the FPTHY grafting model indicate that porcine MHC can positively select murine CD4+ T cells in the thymus, and that murine class II MHC (IAb) in the periphery effectively supports the survival of mouse CD4 cells selected on a porcine MHC. These results would lead to the prediction thatmurine CD4 could interact effectively with porcine MHC class II molecules, and that porcine MHC and mouse class II had considerable homology in the CD4 binding region. To address this possibility, we analyzed the class II MHC amino acid sequencehomology between the CD4 binding region of the murine recipient class II MHC (IAb allele) and its analog in the porcine donor SLA-DQ (SLA-DQd allele). Amino acid sequences correspond to accession numbers A60404 and B60404 (36), HLMSAB (37), A61389 (38), HLMSQB (39), A53278 (40), and HLMSBU (41) of the Protein Identification Resource protein database and P14483 (42) of the Swiss-Prot database. Alignment was performed with the Pile-up program of the Wisconsin Package version 10.2 (Genetics Computer Group, Madison, WI) using the Web facilities of the Spanish node of the EMBnet (http://www.es.embnet.org/). Amino acid sequences 41–56 in the β1 domain (43) and amino acid sequences 133–154 in the β2 domain of class II MHC (44, 45) have been reported to be critical for interactions with the CD4 molecule. Comparison of sequences in the segment 41–56 showed very high conservation between DQd and IAb, with only one amino acid difference. 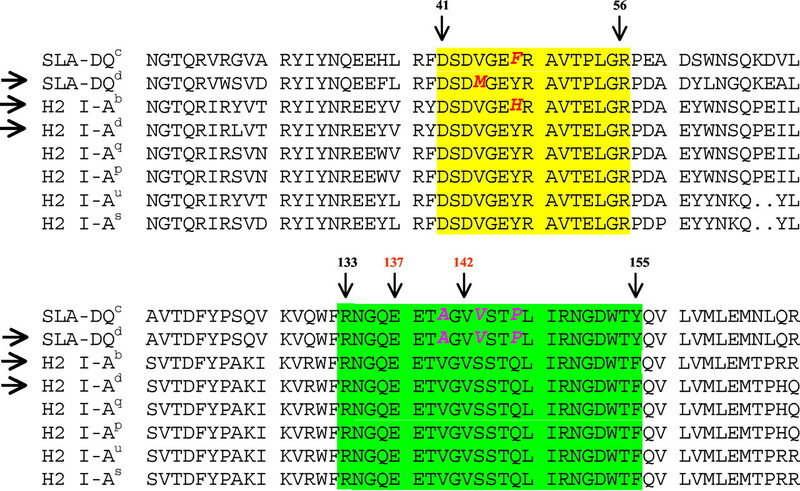 Three amino acids differed in the segment 133–154, although the two individual positions shown to be critical for CD4/class II interaction, Glu137 and Val142 (46), were conserved between the murine and porcine molecules (Fig. 11⇓). BALB/c mice have also been grafted with porcine thymus of different haplotypes and obtained CD4 reconstitution similar to that achieved in C57BL/6 mice (data not shown) (14, 16, 34). Amino acid sequences 41–56 in the β1 domain of mouse class II MHC IAb are identical with those in other strains of mice (IAd, IAq, IAp, IAu, and IAs), with the exception that at position 47, IAb has His instead of Tyr, which is the amino acid present in the rest of the mouse strains tested. However, this difference might not affect the critical interaction between CD4 and MHC. Likewise, amino acid sequences at positions 133–154 in the β2 domain of class II MHC IAb were identical in the different strains of mice tested (IAd, IAq, IAp, IAu, and IAs; Fig. 11⇓). Comparison of porcine and murine class II MHC amino acid sequences in regions critical for CD4/MHC interaction. Yellow highlighted segment of the β1 domain shows the segment involved in the interaction with CD4. Green highlighting shows the segment of the β2 domain involved in the interaction with CD4. Sequences correspond to the MHC class II molecules indicated at left. Bold and italic fonts indicate amino acid differences between sequences. Grafting fetal or neonatal porcine thymus into initially immunocompetent mice that are thymectomized and treated with T cell-depleting Abs allows reconstitution of the CD4 compartment, and these murine CD4 cells are rendered tolerant to donor-specific porcine tissue (9, 10, 32, 34, 35). These mice appear to have normal immunocompetence, in that they are capable of clearing opportunistic infections and responding to protein Ags presented by murine (recipient) class II molecules (12). Studies in this model have demonstrated that pig MHC can positively select functional mouse CD4+ cells in ATX B6 class II KO mice (11) receiving porcine thymic tissue grafts. The positive selection of murine thymocytes in porcine thymic grafts clearly occurs without the involvement of host class II molecules (11, 14). Studies in two different, unrelated TCR transgenic mice bred to selecting and nonselecting host MHC genotypes (14, 15) have demonstrated that xenogeneic porcine MHC is entirely responsible for positive selection, with no demonstrable increase in their selection in mice with a selecting compared with a nonselecting MHC background. These studies, therefore, showed no evidence for participation of murine class II+ hematopoietic cells, which we have shown to be present in porcine thymus grafts (10), in positive selection. These results suggest a role for TCR recognition of species-conserved MHC residues in positive selection and also suggest that a sufficiently broad T cell repertoire is selected by xenogeneic MHC to permit host-restricted T cell responses to occur due to cross-reactivity on mouse MHC (12). Excellent immune responses have also been reported in the clinical situation of patients with severe DiGeorge syndrome who are grafted with allogeneic thymus, despite the fact that the MHC of the donor thymus in which the T cells were selected and the host MHC were completely different (47, 48). It has been recently reported that a diverse T cell repertoire can be positively selected by a single MHC/peptide and that these T cells reacted with the selecting MHC bound to other peptides and with allogeneic MHC molecules (49, 50, 51). Other data using nonselected thymocyte populations indicate that MHC reactivity is imprinted in the germline-encoded portions of the TCR and is independent of positive and negative selection (52, 53). In contrast, there is increasing evidence supporting the idea that the MHC and/or self-peptides on which T cells are selected in the thymus should be the same as that they see in the periphery to support their optimal long-term survival (18, 19, 21, 24, 54). According to this hypothesis, the prediction in our experimental setting would be that murine T cells selected in a highly disparate xenogeneic thymus should lack these signals and die more rapidly in the periphery than do T cells selected in a host-type thymus. It was possible that increased thymic output could compensate for such peripheral losses, thereby maintaining the size of the peripheral CD4 cell pool. The results presented here argue against both possibilities, because the removal of the FPTHY graft did not lead to a dramatic acceleration in the decay of CD4 T cells compared with that observed in graftX NMTHY-grafted mice. Therefore, the lack of the same MHC in the periphery as that of the thymus in which murine CD4 cells were selected did not have a measurable impact on their long-term survival. One explanation for our results would be that the murine T cell repertoire positively selected by porcine MHC in FPTHY grafts is sufficiently broad to include cross-reactivity with murine class II MHC-self peptide complexes, which then provide continuous peripheral signals for long-term survival. However, the similar rate of decay of naive-type CD4 cells in WT and class II KO mice after graftX of FPTHY grafts suggests that class II MHC does not play a major role in supporting the survival of CD4 cells selected on porcine MHC. The “decay” of naive-type CD4 cells in WT mice might in fact have been increased by class II (plus Ag)-induced proliferation, leading to the conversion of these cells to the memory phenotype, a process that cannot occur in class II KO mice. We cannot rule out the possibility that some naive CD4 T cells receive survival signals due to cross-reactivity with class I MHC molecules, as some CD4+ T cells have been reported to recognize class I molecules (55). The maintenance of constant T cell numbers in the periphery is due in part to continuous output of recent thymic emigrants. This rate of T cell exportation remains constant regardless of the composition of the peripheral T cell pool (56, 57). Output of recent thymic emigrants declines as animals age, and peripheral expansion and survival become more important to maintain constant T cell numbers in the periphery (58, 59). As expected, removal of the thymic graft from either FPTHY- or NMTHY-grafted WT or class II KO mice led to a progressive and significant decay of naive CD4 T cells. Our results confirm that the maintenance of a constant peripheral CD4 cell pool not only depends on survival of the T cells, but also requires constant thymic output and peripheral expansion to compensate for the normal turnover of T cells in the periphery. However, a significant decline of CD4 T cells was also observed in non-graftX control NMTHY-grafted WT and class II KO mice over time. We have observed eventual fibrosis of thymic grafts in ATX mice, making it likely that the lifespan of grafted thymic tissue is limited and that these grafts had diminished output due to this process. However, the decline in naive CD4 cell concentration was always more pronounced in graftX mice than in non-graftX controls in WT and class II KO mice receiving NMTHY grafts and in WT mice receiving FPTHY grafts. In contrast to previous reports supporting a critical role for peripheral class II expression for the survival of naive T cells (18, 19, 21), we observed only a slight reduction in the post-graftX:pre-graftX ratio of percent CD4+ PBLs in NMTHY-grafted class II KO mice compared with control NMTHY-grafted WT mice. Surprisingly, this small but significant difference was not reflected in the naive T cell population, but was evident in the memory CD4 subset at 15 wk after graftX. One factor that probably mitigated the decline in CD4 T cells in class II KO mice was the observed migration of class II-positive cells from the WT donor thymus to the periphery of the class II KO mice. Although the presence of these class II-positive cells was scattered, it may have sufficed to provide the needed survival signals to peripheral naive CD4 T cells, as previously reported (20). However, a similar explanation does not apply to the excellent survival of murine CD4 T cells in recipients of FPTHY grafts, as no evidence of porcine cell survival in the periphery was obtained. This is consistent with many studies in our laboratory indicating that porcine hematopoietic cells cannot survive in the periphery of immunocompetent mice on the B6 background, possibly due to destruction by natural Abs (60) or macrophages (61), Ab-independent complement-mediated destruction (62), or other factors. Previous studies (18, 27, 29) have led to the conclusion that expression of the same class II as that of thymus is not critical for the peripheral survival of CD4 T cells. To account for the modestly more marked decay of memory CD4 cells in class II KO than in WT mice after removal of NMTHY or FPTHY grafts, one could speculate that once the thymus is removed, maintenance of the peripheral CD4 cell pool depends entirely on the intrinsic ability of T cells to survive and proliferate. If proliferation is affected by the absence of adequate levels of class II in the environment, then T cells would decline more quickly in class II KO mice than in a class II WT environment. Naive T cells have been shown to convert to the memory phenotype in the absence of Ag under the pressure of a homeostatic stimulus and to proliferate to restore peripheral T cell numbers toward normal (28, 63). This may partially explain the more marked decline in memory CD4 T cells after graftX in class II KO compared with WT recipients of NMTHY or FPTHY grafts, because the reduced availability of class II in the periphery may have prevented this type of proliferation from occurring as T cell numbers decline. Consistent with this interpretation, adoptive transfer experiments of CFSE-labeled CD4 thymocytes into ATX class II WT and class II KO mice showed that there was much less proliferative activity of T cells transferred from WT mice into a class II KO environment (only two divisions in a month), whereas in the presence of class II, proliferation was more marked (data not shown). This result is in agreement with that of Clarke and Rudensky (27), who observed that the adoptive transfer of CFSE-labeled CD4 T cells into class II KO mice led to a slower rate of proliferation compared with transfer to class II WT recipients. The observation that CD4 T cells positively selected on porcine MHC show better survival and/or proliferation in the presence than in the absence of murine class II MHC in the periphery shows that these processes can be supported by an MHC that differs from the one mediating positive selection in the thymus, consistent with some previous studies (26, 27, 54). Paradoxically, levels of peripheral blood murine CD4 T cells selected in FPTHY grafts were maintained significantly longer in graftX and in non-graftX mice after the time of graftX than were the levels in mice that received syngeneic mouse thymus grafts. This could be due to the fact that non-graftX, FPTHY-grafted mice had not yet reached the plateau of T cell reconstitution by this time (15 wk), whereas NMTHY-grafted mice were already fully reconstituted at the time of graftX. Thus, physiological signals supporting homeostatic proliferation of peripheral CD4 cells may have been more active in recipients of FPTHY than in recipients of NMTHY at the time of graftX. One also could speculate that some CD4 cells coming from the pig thymus die in the periphery and that those surviving are a subset that has cross-reactivity on murine MHC, which have already undergone peripheral selection at the time of thymectomy. The amino acid sequence homology found particularly in the regions known to play a critical role in CD4/MHC class II interaction are well conserved between the recipient mouse IAb allele (43, 44, 45) and donor pig SLA-DQd allele. This observation correlates with the observed in vivo phenomenon whereby CD4 T cells are efficiently selected in porcine thymus grafts, differentiated to single positive cells, and survive in the periphery of B6 mice (10, 14). We can conclude from our study that CD4 T cells positively selected on porcine thymus can survive in the periphery of WT mice, and that porcine thymus is not required to produce more T cells than normal syngeneic thymus to maintain a constant peripheral CD4 cell pool. Therefore, grafting discordant xenogeneic thymus could be a feasible approach to reconstituting a new T cell repertoire that is tolerant to xenogeneic Ags. We thank Drs. Henry Winn and Yong-Guang Yang for their critical review of the manuscript, Dr. David H. Sachs for his continuous advice, support, and generosity with pigs and reagents, Mr. Scott Arn for procuring miniature swine donors for these studies, Ms. Denise Pearson for laboratory management, and Mr. Orlando Moreno for outstanding animal care. We would also like to thank Ms. Robin C. Laber for expert assistance with the manuscript. ↵1 This work was supported in part by the National Institutes of Health (Grants POI AI139755 and POI HL 18646) and by a sponsored research agreement from BioTransplant, Inc. J.-I.R.-B. was supported in part by a postdoctoral fellowship from the Spanish Government, Ministerio de Educacion y Cultura (Fellowship Reference EX 34.870.742). ↵2 Current address: Unit of Experimental Transplantation Research, Department of Surgery, Arrixaca University Hospital, 30120 El Palmar, Murcia, Spain. ↵4 Abbreviations used in this paper: KO, knockout; FPTHY, fetal porcine thymus; ATX, adult thymectomy; WT, wild type; SLA, swine leukocyte Ag; graftX, graftectomy; CD62L, CD62 ligand; FCM, flow cytometry; NMTHY, neonatal mouse thymus. ↵5 Y. Zhao, J.-I. Rodriguez-Barbosa. A. Shimizu, K. Swenson, D. H. Sachs, and M. Sykes. Despite efficient intrathymic negative selection of host-reactive T cells, autoimmune disease may develop in porcine thymus-grafted athymic mice: evidence for failure of regulatory mechanisms suppressing autoimmunity. Submitted for publication. Sachs, D. H.. 1992. MHC-homozygous miniature swine. M. M. Swindle, and D. C. Moody, and L. D. Phillips, eds. Swine as Models in Biomedical Research 3 Iowa State University Press, Ames, IA.